It's Wednesday, which means it is time to Skype-in to the Gliebers Executive Meeting. Glenn Glieber (Owner): "... and then I just looked at him and said, 'you know what, Barry, you're fired.' I simply channeled my inner Donald Trump. Do you think anybody from my generation would ever consider 'live tweeting' a company meeting? Communicate this to your respective teams. 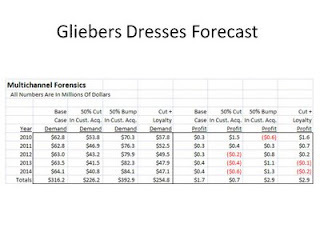 There will be no, and I repeat, NO, live tweeting of any Gliebers Dresses meeting"
Lois Gladstone (Finance): "I hope you have good news for me today! How did my scenario look? Are we most profitable by cutting customer acquisition spending by fifty percent, pocketing two million dollars of cash, and investing a million dollars in a loyalty program that increases customer retention by ten percent?" Kevin: "Let's take a look at the slide I sent you prior to the meeting (click on the image above). I added a scenario, labeled "cut + loyalty". That is the scenario that Lois is advocating. The outcome is a mixed blessing. During the next twelve months, this is easily the most profitable strategy." Kevin: "But as we move out into years three, four, and five, there aren't enough new customers available to participate in the loyalty program. Even though we are adding six or seven million in demand, per year, based on your guess of the impact of a loyalty program, the lack of new customers cause the business to spiral into free-fall once again. By years four and five, we're unprofitable again." Lois Gladstone: "Ok, so this scenario doesn't work. What if we try another scenario?" Kevin: "The best scenario I found is to cut customer acquisition spend by a million dollars, and then funnel every penny back into a loyalty program. If the loyalty program increases loyalty by ten percent, and that is an 'if', then the business is stuck at $63 million in annual demand, and $0.9 million in annual profit. Basically, we can add an additional $0.6 million in annual profit under that scenario. Pepper Morgan (Creative): "What are you saying, Kevin?" Kevin: "I am saying that there are two ways we're going to grow this business. The first way is to increase merchandise productivity. You're already working on that, and if you had any easy answers, you'd already be executing them. The second way is to understand that with a 53% retention rate, or even a 58% retention rate, you must keep the gas pedal on new customer acquisition. You need to spend a large sum of money acquiring customers, every single year, in order for the business to grow." Glenn Glieber: "Kevin, how many times do I have to tell you this? We don't have a couple million dollars of cash laying around to burn in the new customer acquisition fire pit." Sarah Wheldon (Marketing): "And we're already struggling with our acquisition tactics. Our work with ResponseShop suggests that we're acquiring as many customers as we can, and the productivity of the names we are acquiring is slowly eroding. I'm not confident we can acquire a lot more new names." Roger Morgan (Operations): "Neptune Research issued a recent paper that said that marketing dollars are moving from analog channels online. Are we acquiring all the customers we possibly can online?" Sarah Wheldon: "I don't have any extra marketing dollars in my budget to spend on online customer acquisition. We're already spending to our long-term value targets, and I really believe the catalog is causing most of the online conversions anyway. We send a catalog, we drive the customer online, the customer finds a discount coupon via an affiliate, and buys from us. We give away the discount, and we give seven or eight percent to an affiliate. I don't like the way purchases happen online. I have to keep giving away margin and promotion dollars just to get an online order. I don't think any of us had that in mind when we were introduced to e-commerce fifteen years ago." Pepper Morgan: "Didn't Williams Sonoma just say that they are dramatically cutting catalog circulation, investing money in online marketing where the return on investment is better? Couldn't we find poor performing catalog circulation on our housefile, not send catalogs to them, and re-invest the money in online marketing?" Sarah Wheldon: "Oh gosh, that only works for retailers. Next thing you know, you're going to tell me that Nordstrom killed their catalog marketing program and actually became more profitable. That was during the housing bubble, they are a retailer, and all of that is completely irrelevant to our business model, no offense Kevin. We're a traditional cataloger. All catalogers know that the Nordstrom and Bloomingdales and now J. Crew and Williams Sonoma stories are just fluff. Their retail channels make up everything they lose when they stop mailing catalogs. We're different." Pepper Morgan: "Ok Sarah, what is your solution? You can't keep saying no to everything everybody says. Offer us a solution." Sarah Wheldon: "We'll fix this business when the merchandise productivity improves. Comparable segments are spending ten or fifteen percent less than they were spending thirty months ago. We can't manipulate the profit and loss statement by saving money in one place and then increasing loyalty through some program that gives away free dresses or free shipping." Meredith Thompson: "Or maybe we'll fix it when my product is exposed to the right audience." Kevin: "There are other things we can do. Assuming you are inviting me back on Monday, I'd like to share test results compiled by Sarah's team, testing that may give us a way to save money and spend more on customer acquisition." Kevin: "The test that Boris did?" Roger Morgan: "You mean bow-tie guy? He did a test?" Kevin: "Yes, he executed a year-long test, and his test results actually give us a few options to improve our new customer acquisition problem without spending any more money." Kevin: "Ok, when I come back on Monday, I'll illustrate one possible way to improve sales and profit without an immediate improvement in merchandise productivity." Glenn Glieber: "Thanks for popping in again today, Kevin. Fun Stuff! Back to business. The next item on the agenda is our parking lot. It seems that Greg Burns is parking his motorcycle in the covered Executive parking area. We can't have that. He claims his motorcycle is eco-friendly and should be protected from the elements if he is going to continue trying to protect the planet. Executive parking is an earned perk, not one granted to people trying to save the planet. Roger, I'd like his motorcycle towed tomorrow if he does this again, can you do that for me?"